Babette Feasts: Stone Crab House: Endangered? 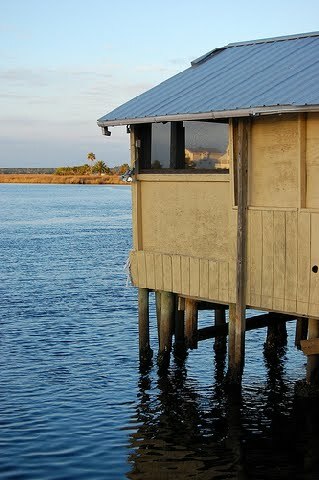 With the sad news of the spreading oil spill, I cannot help but think about my visit to the Gulf Coast in November 2008, when I got to eat stone crabs on the dock of this crab house--this is where the fishermen brought their crabs to be sorted, steamed, chilled and weighed. The owner brought handfuls of stone crab claws out to the dock and cracked them open with a fisherman's hook--we just enjoyed his company, the crab, the scenery. The night I spent alone on a houseboat, waking with every creak and splash I could hear in the water. You can see the resulting video over at VisitFlorida.com. We should all worry that something this special is so endangered with all the offshore drilling--and the accidents that can happen. So far, the spill is focusing on the wetlands nearest New Orleans. But it is spreading--keep the fishermen and women in your thoughts. This is indeed a very sad and scary situation, accountable for so many problems in such a wide array of areas. I was walking at the beach today here on Cape Cod and the beaches of the Gulf Coast were on my mind, imaging the oil washing up. People who live near Nantucket Sound have been complaining about the wind mills, but they are so much better than having oil rigs!